Lovely 2 bed bungalow style apartment with roof terrace - Property for sale. 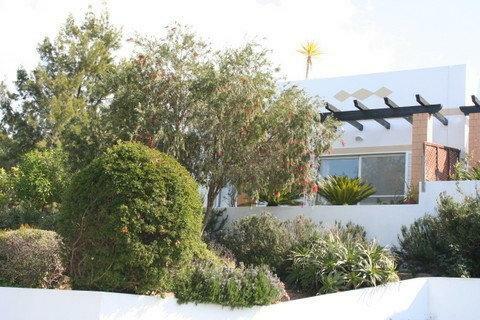 Full Description: In a small condominium on the Eastern outskirts of Carvoeiro is this 2 bed furnished and equipped apartment. Close to local beaches, golf and restaurants and the centre of town just a very short drive away. Carvoeiro is one of the most popular resorts in the Western Algarve and still retains much of the feel of the original fishing village with the absence of any high rise development. This end of terrace apartment features a large outside garden area and with the owners partially enclosing the kitchen terrace adding what is in effect a separate dining room. The kitchen is fully fitted leading onto a good sized lounge/dining room with a traditional wood burning fireplace and access to the spacious terrace. There are two double bedrooms with wardrobes and a fully tiled shower room with w/c. The apartment is decorated and furnished to a very high standard and quality. Perhaps the best feature of this apartment is the roof terrace is reached by an outside staircase and offers extensive views of the surrounding area including the nearby Par 3 golf course regarded as one of the best in the Algarve. Also outside, there is a communal swimming pool with sunbathing terraces and ample off road parking. With nearby beaches, the centre of Carvoeiro a short drive away and close to some of the best restaurants in the area, this apartment is an ideal rental property, great for permanent living or long stays. Viewing recommended.